JAMESTOWN: Zonta Club of Jamestown is overjoyed to announce the donation of $1,000 from the Breast Cancer Support Group to Lily’s Hope. Lily’s Hope is a free resource in Chautauqua County for women experiencing hair loss due to a medical diagnosis or treatment. At Lily’s Hope, women can receive a free wig, cap, hat or other accessories as available. Zonta Club will utilize the donation toward more new wigs and medical accessories. Recently, Zonta Club expanded this offering to women in Warren, PA and surrounding counties as requested. To make an appointment, one only has to call the UPMC Chautauqua WCA Cancer Treatment Center at (716) 487-0141. Lily’s Hope is located at the Jones Memorial Health Center, 51 Glasgow Avenue in Jamestown. For more information about Lily’s Hope or Zonta Club of Jamestown, visit ZontaJamestown.org or find our community pages on Facebook. Supported by Zonta International to underline “Zonta Says No to Violence Against Women,” the campaign runs from November 25th, the International Day for the Elimination of Violence Against Women, through Dec 10th, Human Rights Day. Throughout the 16 days, you’ll find yellow ribbons on city bridges as well as a large banner on Main street between Fifth and Sixth Streets, and a second large banner on the corner of Fluvanna and Washington streets, in Jamestown. Zonta club encourages you to stop and take a ‘selfie’ with the banners and post your picture to social media tagged with #ZontaSaysNO. In such a world, women have access to all resources and are represented in decision-making positions on an equal basis with men. In such a world, no woman lives in fear of violence. For more information on the campaign visit: zontasaysno.com. If you’re interested in joining the campaign or seek membership to the club visit ZontaJamestown.org or like our community page on Facebook. JAMESTOWN: Fittingly, when the Zonta Club of Jamestown held its Zontian of the Year dinner this week, the award went to Lily Olson. This came as a complete surprise to Lily, a past president of the club, who has done much in the service of our community. Lily’s Hope is her legacy to our area, and we are all proud to be her friends and Zonta sisters. On November 5 we will celebrate the 7th anniversary of the opening of Lily’s Hope at the Cancer Treatment Center at 51 Glasgow Avenue in Jamestown. 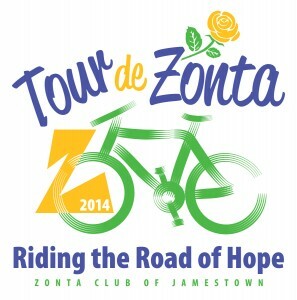 Lily’s Hope has been sponsored by UPMC Chautauqua WCA and the Zonta Club of Jamestown. Lily’s Hope was the brainchild of Lily, a former nurse at the hospital. Lily strongly believed that local women who were losing their hair for health reasons should not have to travel out of town to procure a wig, and she worked for this with both the hospital board and the Zonta Club membership. It is because of Lily that we now have the lovely Lily’s Hope for local women in need of a wig. Lily dealt with a limited budget from the start but was still able to help anyone who came to her for help. The room for Lily’s Hope was graciously donated by UPMC Chautauqua WCA hospital at Jones Memorial Health Center, and furnishings were donated by local businesses. In the past seven years monetary donations as well as soft knitted hats, scarves, turbans, pillows, and quilted bags have been provided by individuals and local groups, schools and clubs. Appointments for wig fittings can be set up by calling the Cancer Treatment Center at (716) 487-0141. Lily’s Hope is an endeavor that Lily Olson should be proud of – as she shown the rest of us what can be accomplished with determination and effort. We are thrilled that she is our 2017 Zontian of the Year! Thank you to Ellen Munella for her contributions to this article. Zonta Club is one of 1200 chapters of Zonta International. Visit zonta.org or zontajamestown.org for more information about Zonta and the mission of empowering women through service and advocacy. 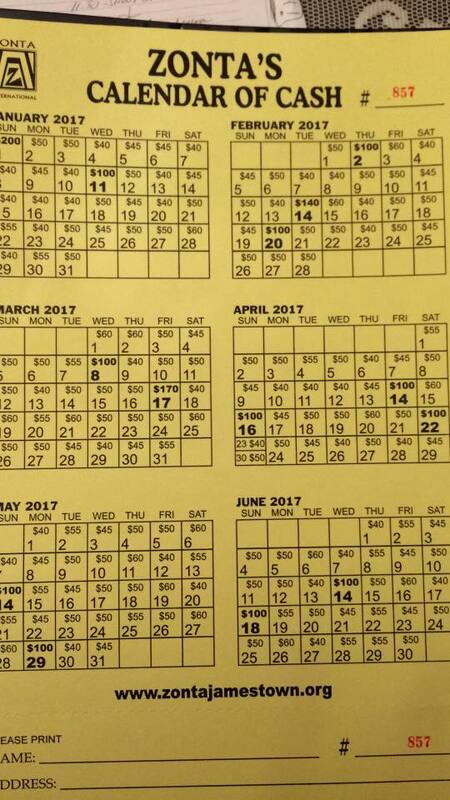 JAMESTOWN: Zonta Club of Jamestown “Calendars of Cash” fundraiser calendars are currently being sold by all Zonta members for a $20 donation. The Zonta Club is a service organization with the mission of empowering women through service and advocacy. The calendar donations fund the various service projects of the club including: YWCA Team Program, The Princess Club, The Jamestown Boys and Girls Club, The Salvation Army Anew Center, several locally funded scholarships, and Zonta’s successful women’s outreach: “Lily’s Hope” at the UPMC Chautauqua WCA Cancer Treatment Center, at Jones Memorial Health Center. Lily’s Hope provides free head coverings for local women going through any medical treatment where hair loss is evident. Also available are scarves, turbans, quilted bags and pillows which have been lovingly donated from the community. [email protected] or like us on Facebook to request your calendar. Thank you in advance for your support! 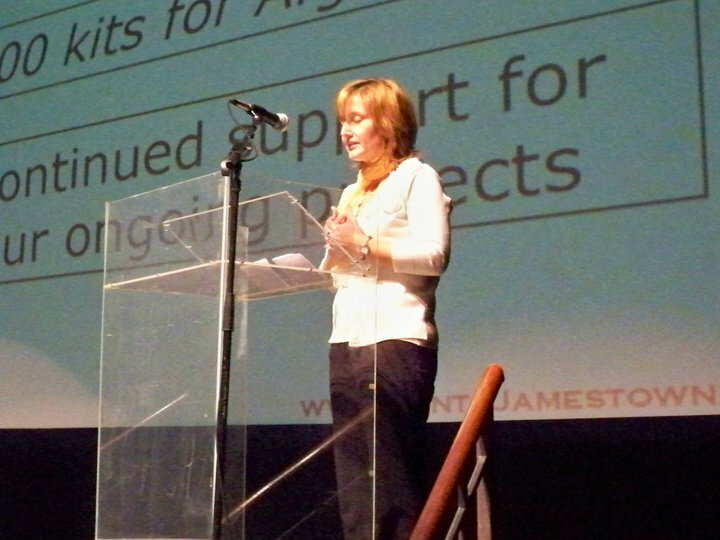 JAMESTOWN: Zonta Club of Jamestown inducted Angie Peck to membership at the June business meeting. 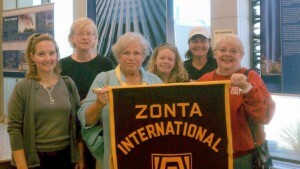 Zonta Club of Jamestown is the 12th chartered club of Zonta International’s 1,200 clubs. Started in 1919 in Buffalo, NY, Zonta International has over 30,000 members in 67 different countries. For more information visit ZontaJamestown.org or /ZontaClubofJamestown on Facebook. 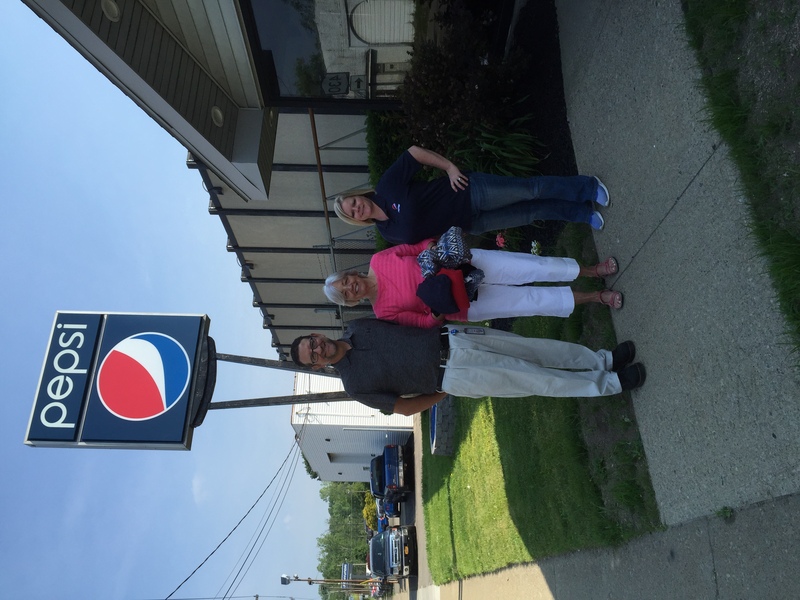 Employees of Pepsi in Jamestown recently donated clothing to Zonta Club of Jamestown. Zonta will deliver the clothing to Chautauqua County emergency rooms and to local shelters. 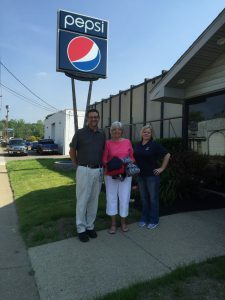 Pictured are Fred Pellerito of Pepsi; Kelli Warner, Pepsi employee and Zonta member; and Janet Lindstrom, Zonta Club representative. PICTURED: L-R front row Ellen Munella, Rosie Papalia and Wendy Burns. Back row left to right: Jean Schrader, Roz Newton, Julie Dudgeon, Kathy Stedman, Eileen Healy, Roberta Anderson and Marcia Restivo. 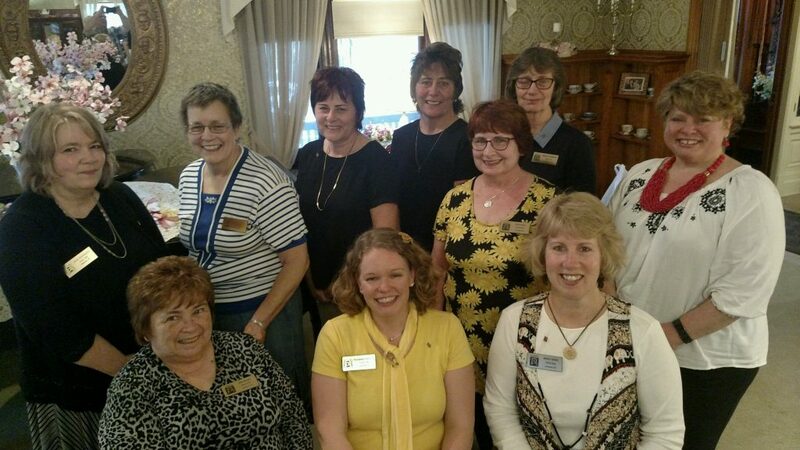 JAMESTOWN: Zonta Club of Jamestown installed new officers and board members at their annual dinner, May 17th at the Marvin House. Filling the terms of officers are Rosanna Papalia, President; President-Elect, Ellen Munella; Vice President, Wendy Burns; Secretary, Eileen Healy and Co-Treasurers, Jean Schrader and Roz Newton. The Board of Directors are: Julie Dudgeon, Kathy Stedman, Roberta Anderson and Marcia Restivo. For more information about the Zonta Club of Jamestown, visit www.ZontaJamestown.org, facebook /ZontaClubofJamestown community page, or on Twitter @ZontaJamestown. 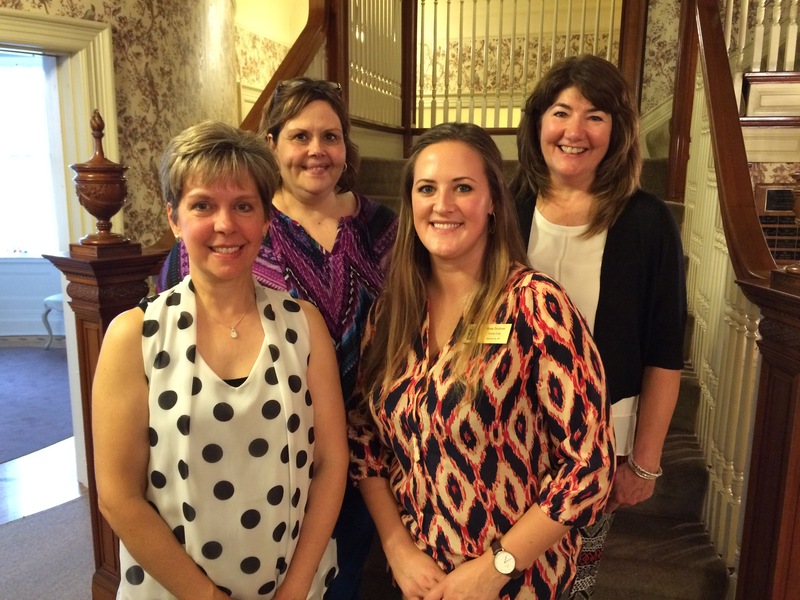 JAMESTOWN: Zonta Club of Jamestown is proud to announce new members! Debbie Rowe, Mary Cook, Besty Goldman and Donna Grekalski were inducted at the Zonta annual dinner, May 17th at the Marvin House in Jamestown. 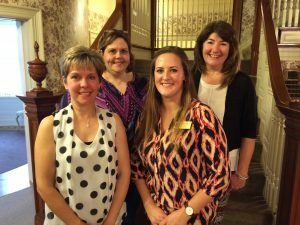 Residents of the area, the four are welcomed to a local chapter of Zonta International “working to empower women through service and advocacy.” The Jamestown club now marks 48 active members. For more information on Zonta, visit Zonta.org. 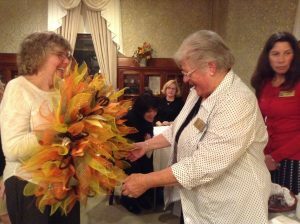 To learn more about the local club, see us on Facebook /zontaclubofjamestown; on the website www.zontajamestown.org or twitter @ZontaJamestown. Zonta Club of Jamestown announces Bob Evans fundraiser for Lily’s Hope. Please download flyer at link below and bring with you to Bob Evans on May 10th from 9am to 8pm to donate 15% of your check to Lily’s Hope. Lily’s Hope is a resource that provides wigs, caps, hats and soft turbans FREE of charge, for women living in or being treated in, Chautauqua County for a medical condition where they are experiencing hair loss. Visit us on Facebook to like our page and get more information. LUNAFEST is a film festival that travels to over 175 cities across the U.S. and shown to over 25,000 people. Each year, various organizations bring this event to their communities to benefit the fight against breast cancer. They also have the opportunity to raise funds for other local non-profits. Visit www.lunafest.org for more information. Zonta wishes to thank the generous sponsors making LUNAFEST possible: Media One Group; ERA Team VP Real Estate; Moonbrook Veterinary Hospital; The Resource Center; Brown Surveying, PC; Split Creek Farm; Sinclairville Free Library; Marcia Bliss, CPA; Phillips Lytle, LLP; See Zurh House; Pepsi and Friends of Zonta. 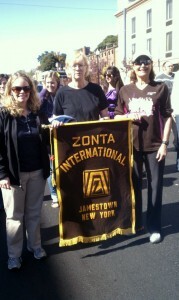 The Zonta Club of Jamestown is one of 1200 chapters of Zonta International. For more information visit zontajamestown.org, the community page on Facebook or Twitter @ZontaJamestown. 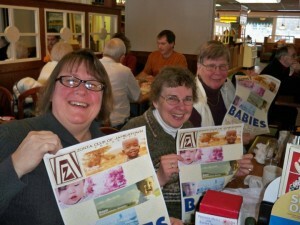 Zonta Club of Jamestown recently met to assemble birthing kits at St. Timothy’s Church in Bemus Point. 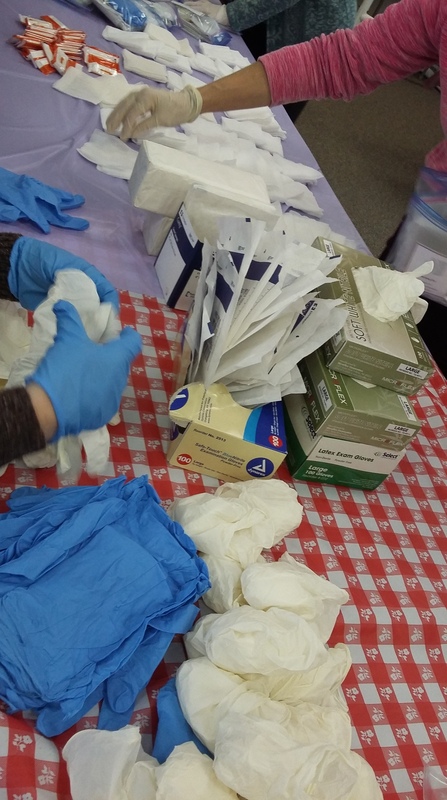 Birthing Kits contain a 4’X4′ piece of plastic sheeting a pair of surgical gloves, five pieces of 4X4 gauze, a piece of soap, three cord ties, and a razor blade all of which are packed into a re-sealable bag. Hoping to reduce the chance of infection for both mother and baby, these humble kits help provide women in third world countries with a fundamentally clean place in which to give birth. Zonta Club extends its sincerest thanks to JAMA and Jamestown Primary Care for their donations of materials. 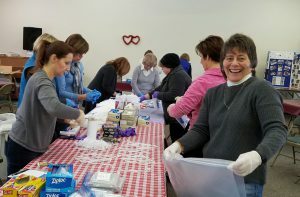 793 kits were assembled by volunteers in two and a half hours; 75 will be sent immediately with Mary Rappole, Zonta Club member and retired Nurse Practitioner, on her mission trip to Haiti. In the past birthing kits went to Haiti, Honduras, Nepal, Afganistan and the African continent. 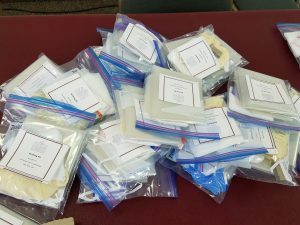 If anyone in the community knows of other countries where birthing kits are needed or of travelers willing to take supplies with them, please let Zonta know by emailing [email protected] Training, bags, and other supplies are available for persons willing to further volunteer with this project. 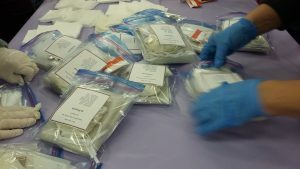 Organizer of this assembly, MaryAnn Spanos, is also requesting donations of non-sterile gauze 4X4’s so additional birthing kits can be assembled later this spring; Or if anyone has old suitcases to donate please drop them off at Marcia Bliss’ CPA office, 511 North Main Street, Jamestown. They will be packed with kits for future mission trips. The Zonta Club extends it’s sincerest thanks to JAMA, UPMC Chautauqua WCA and Jamestown Primary Care for their donations of materials. New Zonta Club members, Jennifer Peck-Wells (L) and Kerry Mihalko (R) are pictured with Ellen Munella (middle) on the stairs at the Marvin House in Jamestown. 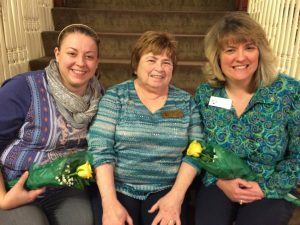 The Zonta Club of Jamestown welcomed two new members at their recent meeting. Jennifer Peck-Wells, originally from Sidney, New York now lives and works in Jamestown at MD ELEKTRONIK. She is a graduate of Sidney High School, the University at Buffalo and has her master’s degree from Western Governors University. Jennifer is married to Dan Wells with two young boys, Sammy and Max. Kerry Mihalko is the coordinator of the Diabetes education program at UPMC Chautauqua WCA in Jamestown. Originally from Cassadaga, New York, Kerry is a graduate of Cassadaga Valley Central School and Seton Hill University. She is married to her wonderful husband Paul with 2 great boys, AJ and Trent. 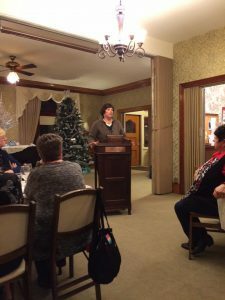 JAMESTOWN: February is heart month and the Zonta Club of Jamestown recently learned much more about women’s heart health as the club welcomed guest speaker, Brenda Fitzgerald, RN from UPMC Chautauqua WCA Heart Center. 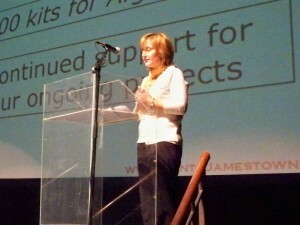 During her speech, Brenda reminded us that heart disease is the most common cause of death for women, surpassing all other health issues because of it’s ‘silent symptoms.’ Brenda warned that often women have no idea they are having a heart attack because symptoms manifest in different ways from which we are most familiar. Pain associated with a heart attack can come from the abdomen, side or back. Women feel weak, out of breath, have trouble concentrating. It’s a great idea to consult with a doctor and regular checkups are the most important thing women can do for their health. During the Q and A portion of the program Zonta members were surprised to learn that one of their members, Bonnie Rappole, suffers from heart disease. Bonnie said, “After facing the mental and physical challenges of finding out I had heart disease, and never being able to find a support group, I decided to try and start one.” The group: ‘Sisters of the Heart’ meets at least once a month for breakfast or lunch and shares their thoughts, concerns and friendship. Zonta Club is comprised of executives and professionals working together to empower women through service and advocacy. Zonta not only supports programs in the community designed to empower women and girls, members also discuss issues effecting women at regular meetings. 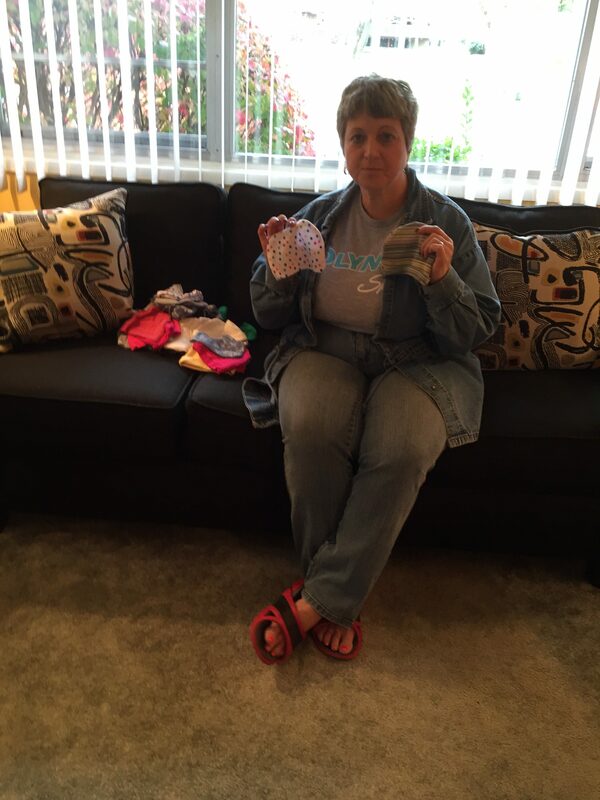 Ann Marie Phillips of Delta Kappa Gamma poses with baby hats donated by her sorority to the Zonta Club of Jamestown. JAMESTOWN, NY: It’s been several years since the Zonta Club of Jamestown started sending life-saving kits to foreign countries. The Zonta Club birthing kits are sent to countries where women are typically assisted in birthing their babies without the luxury of sterile hospitals or clean practices. 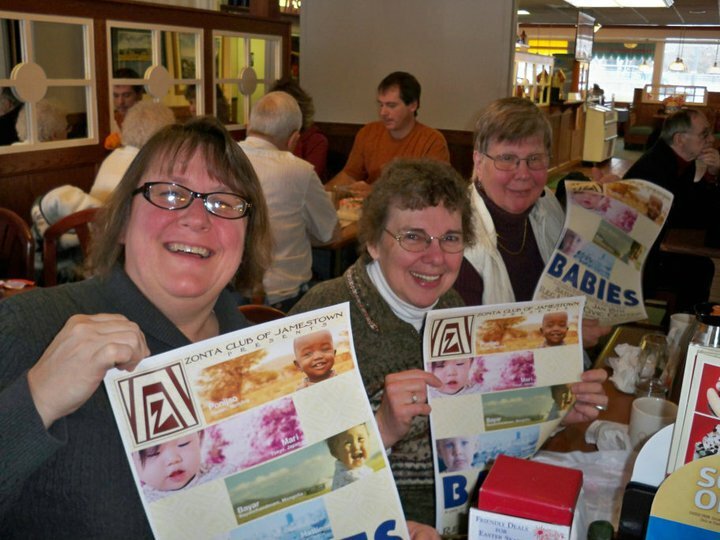 Begun in Australia by a Zonta Club, now many countries make the kits to send forward for healthy, clean births. For example, in Honduras, a midwife delivers women’s babies in the back room of a bar on a cot that has received many births. She has no regular laundry service or trash collection for the refuse from deliveries. The Zonta Club of Jamestown works with this midwife to provide clean materials. In Nepal, some babies are born in such dirty conditions that they are blinded by diseases transmitted by the environment and are then shunned by family and society. This is where Zonta hopes to help empower and advocate for women with their kits to a clean birth. The birthing kits built by the Zonta Club contain latex-free gloves, a piece of soap, gauze pads, three umbilical cord ties, and a razor blade all in a small plastic resealable bag. Now the club hopes to include a baby hat in the kit. The baby hat will keep the baby’s warmth within, making them less susceptible to sickness and disease. This is where Delta Kappa Gamma comes in with their donation of 58 baby hats. Ann Marie Phillips, member of Delta Kappa Gamma brought the donated hats to the Zonta Club recently with a great connection. Ann Marie had received items from Zonta’s program “Lily’s Hope” which provides free wigs, caps, hats and scarves to those who suffer hair loss as a side-effect of a medical condition or treatment. In effort to ‘pay Zonta back’, Delta Kappa Gamma made backpacks for others who visit “Lily’s Hope” at the WCA Cancer Treatment Center and want something wonderful to carry their new items in for the ride home. Ann Marie says the sorority continuously looks for service projects and at the latest donation of backpacks, heard about the hats for the birthing kits, and jumped into action! The Zonta Club is so pleased with the backpack and baby hat donations. If you are interested in helping or learning more about the Zonta Club of Jamestown, visit ZontaJamestown.org, tweet us @ZontaJamestown, or like us on our Facebook Community Page. Special thanks to Ann Marie Phillips and Ellen Munella for the picture and community connections! 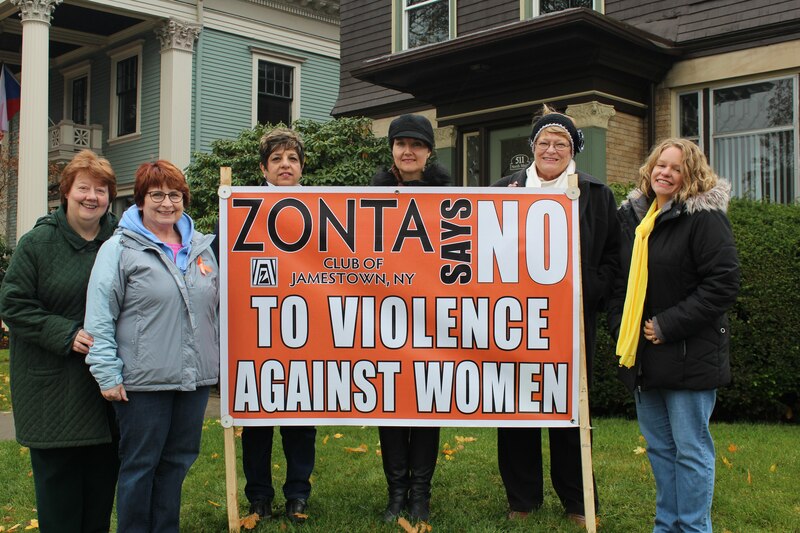 On 25 November, Zonta Club of Jamestown, NY, along with members of the local community, will be trying to spread awareness to the region during 16 Days of Activism Against Gender Violence – an international campaign originating from the first Women’s Global Leadership Institute sponsored by the Center for Women’s Global Leadership in 1991. Zonta International’s nearly 1,200 clubs in 65 countries are participating in this effort in their local communities in support of Zonta Says NO, a campaign to raise awareness of and increase actions to end violence against women and girls around the world through service and advocacy. 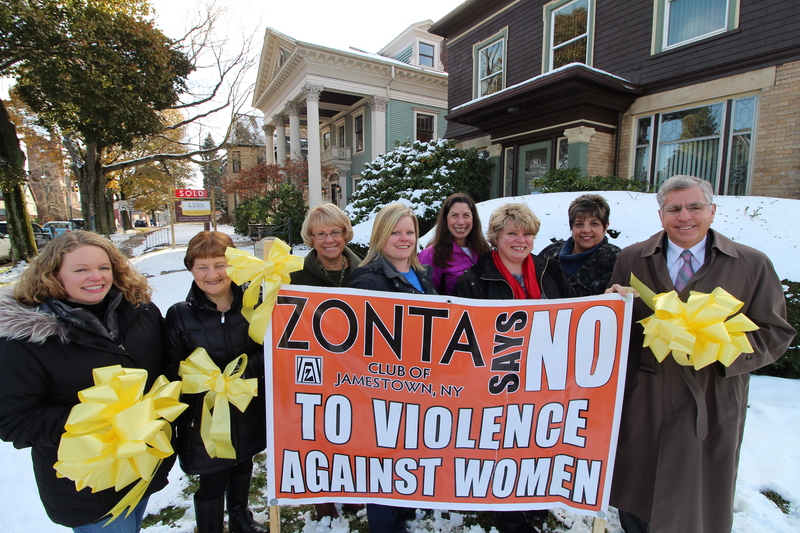 Since June 2012, the Zonta International Foundation has raised more than $600,000 to fight violence against women. 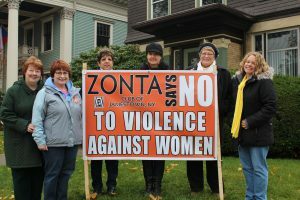 Zonta clubs across the world have organized more than 40 events as part of Zonta Says NO, from panel discussions on violence against women and screenings of topical films, to displaying Zonta Says NO banners and hosting charity auctions. The local club has a banner stationed in from of Marcia Bliss CPA’s office on North Main Street between 5th and 6th streets in Jamestown. Members posed with the banner shortly after it was installed. Members and their families are also taking pictures with “I Support” signs in effort to post to Facebook and share online. 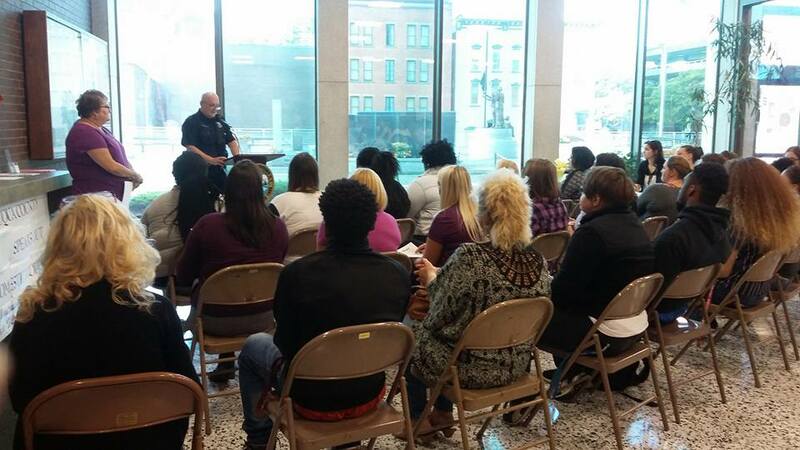 “Domestic Violence is a real and true issue in our community. It’s time to pay attention to the causes, take it seriously and discuss a way to stop to the violence. It’s important that we realize that women are not the only victims. Men are also victims of domestic violence, as are children and those who witness it.” Said Rosie Papalia, President-Elect of the Jamestown Zonta Club. Founded in 1919, Zonta International is a global organization of executives and professionals working together to empower women through service and advocacy. 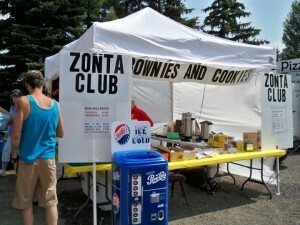 With more than 30,000 members belonging to nearly 1,200 clubs in 65 countries, Zontians all over the world volunteer their time, talent and support to local and international service projects and educational programs. To learn more, visit www.zonta.org. 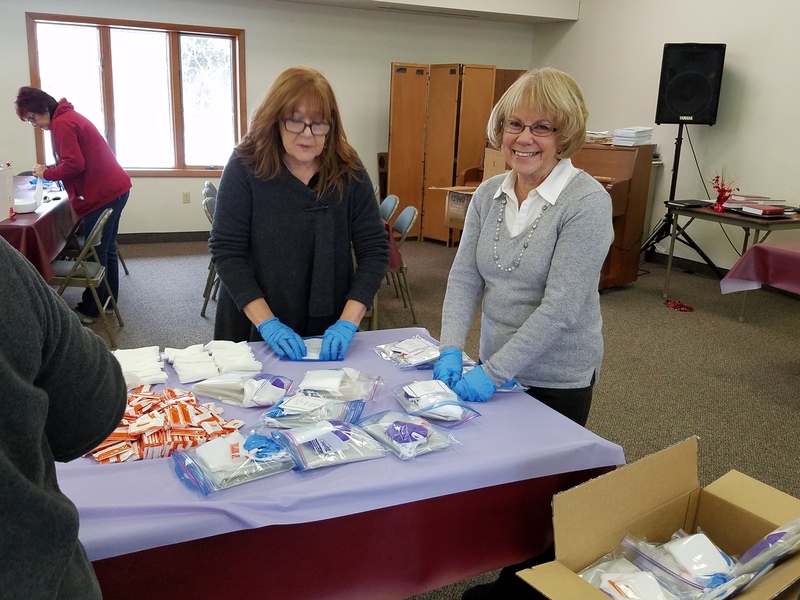 Zonta Club of Jamestown supports programs throughout the year including Lily’s Hope at the WCA Cancer Treatment Center on Glasgow Ave., packing and sending Birthing kits to underserved countries and supporting many local organizations. Zonta Says NO began in November 2012 focusing on the service and advocacy actions of Zonta clubs and districts to prevent and end violence against women and girls in their local communities. Zonta International’s ongoing efforts to end violence against women and girls are carried out through the Zonta International Strategies to End Violence against Women (ZISVAW) program and through Zonta’s partnerships with the United Nations and its agencies. 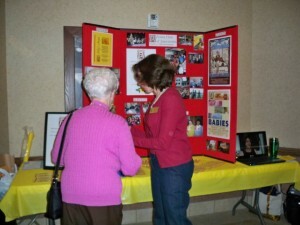 To learn more about “Zonta Says NO” and join the campaign, please visit zontasaysno.com. For more information about Zonta International and opportunities to join this global organization of executives and professionals working to advance the status of women worldwide, please visit www.zonta.org. WE’RE CELEBRATING 95 YEARS OF COMMUNITY SERVICE! 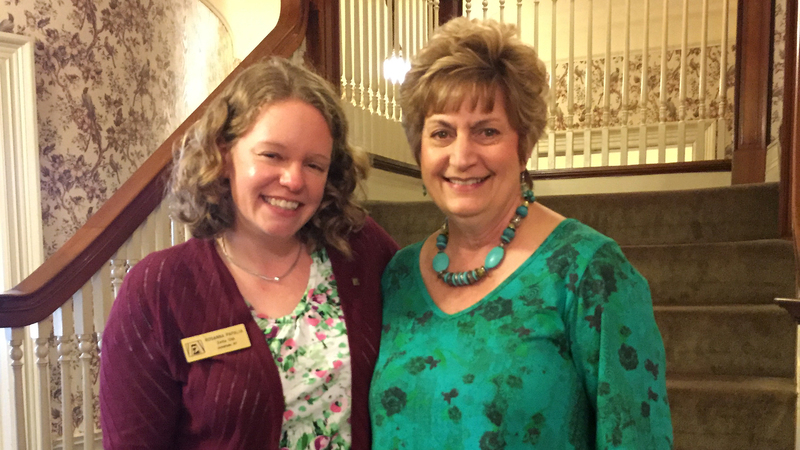 JAMESTOWN: Zonta Club of Jamestown recently received a letter of congratulations from Sonja Honig Schough, Zonta International President 2016-2018, on its 95th anniversary. Chartered on November 17, 1921, Zonta Club of Jamestown was the 12th of 1,200 chapters created internationally. Much like Rotary International, Zonta is a service organization spanning the world in 67 different countries, with over 30,000 members. Working to make a difference, Zonta’s mission is to “empower women through service and advocacy.” The club gives money, time and talent to local programs and organizations that help women and girls in a supportive environment. 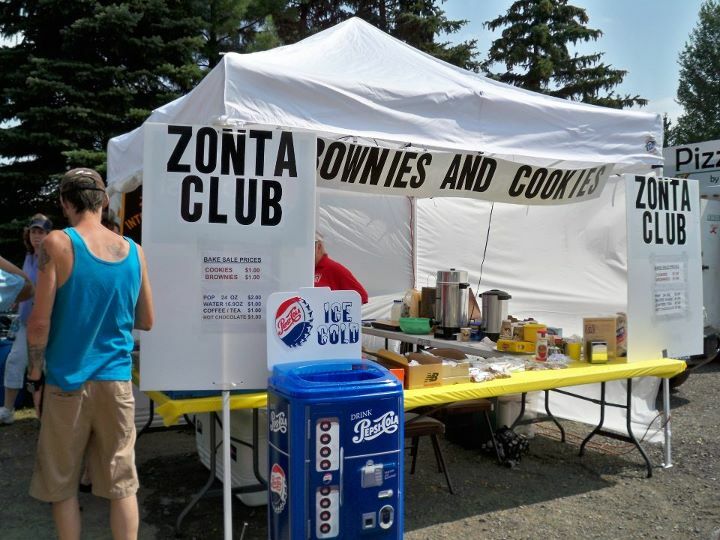 Programs supported by Zonta include: The Princess Club, Boys & Girls Club, the Girl Scouts, YWCA TEAM, Chautauqua Striders, Child Advocacy Program (CAP), Salvation Army Anew Center, Birdie-Turner Home, Prendergast Library, Chautauqua Adult Daycare and so many more. Zonta Club of Jamestown traces its beginnings to 1921 when an Albany Zontian visited the Jamestown City Clerk’s office, staffed by Mary Bargar. Together with Marjorie Allen, a reporter for the Jamestown Morning Post, they discussed the possibility of establishing a club in Jamestown. On November 17, 1921, four women from Buffalo, including Marian de Forest, Zonta’s founder, completed the final arrangements. Two years after the original nine clubs united, 19 women signed the Charter #12 and, before the year ended, 25 new members joined. Marjorie Allen was elected the club’s first president. Weekly Wednesday meetings were often held at the Samuel Hotel. To the meetings, Zonta invited many well known community speakers including: the Honorable Robert H. Jackson, Dr. Arthur Bestor of Chautauqua, Mayor Samuel Carlson, and Edith Ainge, who was jailed for picketing the White House for Women’s Suffrage. Through the years, Zonta Club has hosted luncheons at Chautauqua Institution with former heads of CARE, International; Yakina Zakoobi, controversial young women’s school builder from Afganistan; the Reverend Joan Brown Campbell, formerly of Chautauqua Institution, and more! Having a history of opening and supporting local programs, Zonta is credited with starting Girl Scouts in the Jamestown area, as well as the Jamestown version of the Girls Club. 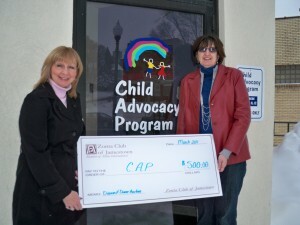 Recently, Zonta contributed financially to the new Blackwell Chapel Baby Cafe housed in the Water Street Gateway Center. The Zonta Club of Jamestown most recently launched a very successful community project in 2010 called “Lily’s Hope.” “Lily’s Hope” is a resource for women in the area experiencing hair loss due to any medical condition. Woman can receive a head covering and other assorted items, free of charge. 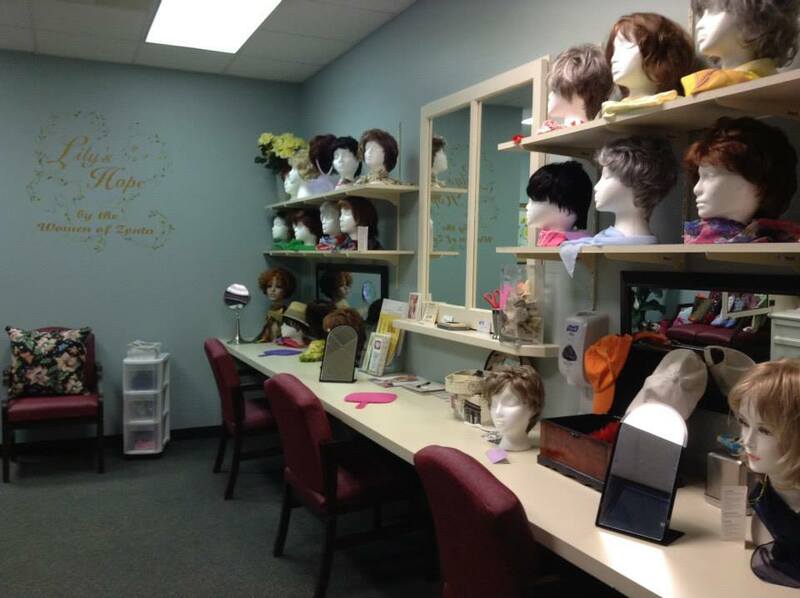 The wig room is located at WCA Hospitals Cancer Treatment Center on Glasgow Avenue in Jamestown. 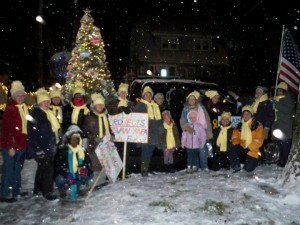 For more information about the Zonta Club of Jamestown, visit its website at www.ZontaJamestown.org, “like” its Facebook community page or see it on Twitter @ZontaJamestown. JAMESTOWN: Wednesday, October 19th, The Zonta Club of Jamestown announced their Zontian of the Year: Bonnie DeJoy. A member since 2006, Bonnie was president of the Zonta Club of Jamestown from 2013-2015. She is a Vice President of Regulatory Affairs for Trinity Biotech USA, has a daughter, Danielle DeJoy Moss and two adopted dogs Teddy and Jackson. 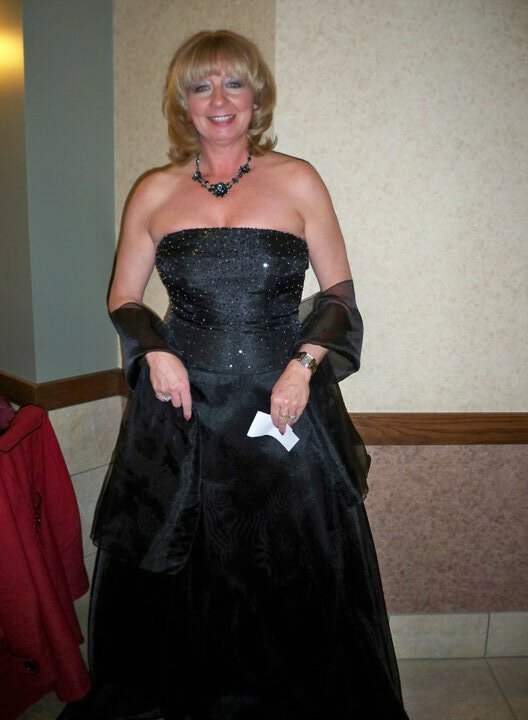 “Active in the community and instrumental in many of Zonta’s functions, Bonnie has supported and advocated for women locally and internationally. She was an organized and fantastic President. She’s a solid communicator. She’s a great representative to have from the U.S. We in Zonta are very proud of her and all her accomplishments,” said Rosie Papalia, President Elect, Zonta Club of Jamestown and Chair of the Zontian of the Year program. The program consisted of a somewhat visual biography of clues of the mystery Zontian of the Year’s life. Getting more detailed toward the end with actual names and favorite stories from Bonnie’s daughter and points of information from good friend Bill Burley. 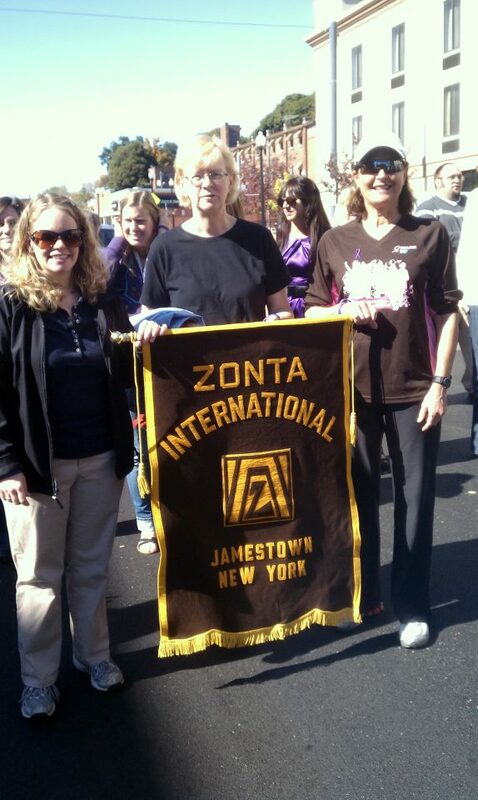 The Zonta Club of Jamestown is one of 1200 chapters of Zonta International, a service organization. Their mission is: Empowering women through service and advocacy. For more information about the Zonta Club visit their website at www.zontajamestown.org or International at Zonta.org; Like them on Facebook or follow on Twitter @ZontaJamestown. 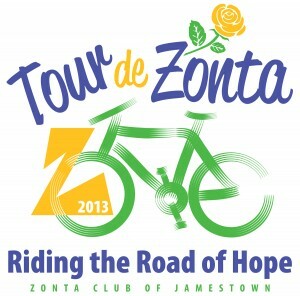 JAMESTOWN, NY: A local service club, the Zonta Club of Jamestown, announces it’s annual fundraiser has begun! 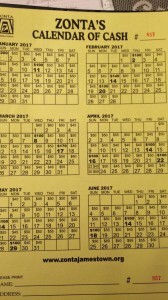 The Zonta “Calendars of Cash” are currently being offered by all Zonta members for a $20 donation. The calendars fund the various service projects of the club including: YWCA Team Program, The Princess Club, The Jamestown Boys and Girls Club, The Salvation Army Anew Center, several locally funded scholarships, and Zonta’s successful women’s outreach: “Lily’s Hope” at the WCA Cancer Treatment Center, at Jones Memorial Health Center. [email protected]. Thank you in advance for your support! JAMESTOWN: Sharon Salvaggio (PICTURED), talented quilter from a local group and cancer survivor, stands with the recent donation to Lily’s Hope. The quilting group have donated about 30 bags each year for the past three years to women who are attending Lily’s Hope for their wig, cap, hat or scarf. Women who live in, or are being treated in Chautauqua County can come to Lily’s Hope for these and more supplies – FREE of charge – due to the generosity of the Zonta Club of Jamestown and our community. Lily’s Hope is located at the WCA Cancer Treatment Center housed within the Jones Memorial Health Center on Glasgow Avenue. If you would like to make an appointment for a fitting, please call (716) 664-8670. 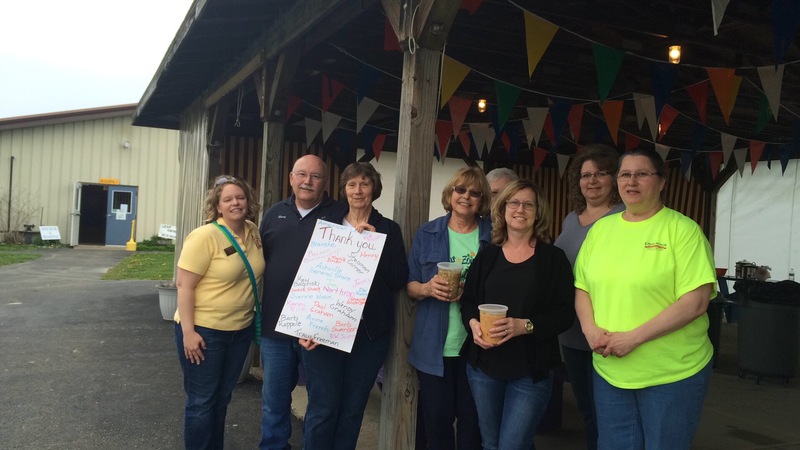 JAMESTOWN: The Zonta Club of Jamestown received a $1,000 gift toward their Lily’s Hope service program, recently. The club wishes to recognize the fundraising and generosity of the Breast Cancer Support Group of Jamestown for all they’ve done for Lily’s Hope. 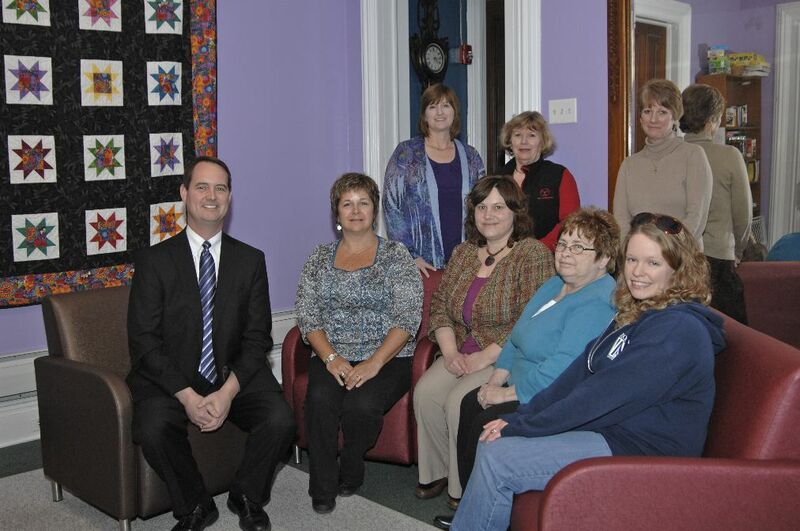 To date, the Breast Cancer Support group in Jamestown has donated over $6,000. Lily’s Hope is a FREE resource for women who live in, or are being treated in, Chautauqua County for any medical diagnosis where hair loss is evident. Lily’s Hope provides free wigs, caps, hats, turbans, scarves and/or other accessories at their room which was lovingly donated and is maintained by WCA Hospital at the Jones Memorial Health Center on Glasgow Avenue in Jamestown. JAMESTOWN: The Zonta Club of Jamestown offers five scholarships and awards based on merit and need in the Chautauqua County area. The Mary Lou Costanzo Scholarship is the newest scholarship added to the roster. Mary Lou Costanzo was a retired deputy director for the Chautauqua County Department of Social Services. She was also a communicant of St. James Catholic Church, a past Zonta Club President and Zonta Area 5 Director. Along with her love for travel and learning, Mary Lou volunteered for WCA Hospital and the American Red Cross. “Mary Lou was a treasured member of our club for many years and this scholarship honors her memory. She felt a special connection to people who wanted do more, work harder, and progress in their personal and professional growth,” said Rosie Papalia, President-Elect and public relations chair for the club. 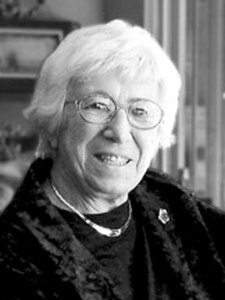 The ‘Mary Lou Costanzo Zonta Scholarship Fund’ was established to assist female student who has previously obtained a vocational certification, associate, or bachelor’s degree and is furthering her education after an absence of a year or more from school. She must also demonstrate financial need. “The recent LUNAFEST Film Festival held in April gave this scholarship a great ‘bump!’ We were able to add $2,000 to the fund, so we are half-way to the point where we can start giving out sustained gifts to returning students,” added Rosie. To contribute to the Mary Lou Costanzo fund, visit: crcfonline.org and search for Mary Lou Costanzo at the bottom of the page. CHAUTAUQUA COUNTY: Cross Roads Farm and Craft Market announces great success from the annual SOUP-R Saturday to benefit “Lily’s Hope.” Thanks to the volunteers from the Women of Zonta, as well as the vendors at Cross Roads, Lily’s Hope will be able to further its mission of mercy for those battling cancer in Chautauqua County. SOUP-R Saturday was held on Saturday, May 7th at the Market. $640 was raised to help the Zonta Club provide FREE wigs, hats, turbans, scarves and other accessories via “Lily’s Hope.” The service is provided for women who live in, or are going through treatment in Chautauqua County, and are experiencing hair loss as a side effect of their medical diagnosis or treatment. “Lily’s Hope” is located at the WCA Cancer Treatment Center at Jones Memorial Hospital. The soup cook-off, an annual event at the Cross Roads, features a variety of donated soups, served up by Zonta volunteers. Visitors to Cross Roads may pay to taste the soups, then buy by the bowl or the take-home container. 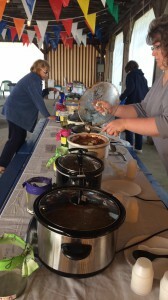 At the end of the day, the soup that has raised the most money is deemed the People’s Choice winner. In addition, a team of judges determine their winners. This year the judges rated 24 soups. Tied for first place were Suanne Work for Chicken Pot Pie soup and Kyle Douglas for his previously award-winning Chicken Wing soup. In the Judge’s 2nd place: Jan Northrop for Chicken Tortilla was tied with Anne French for her Broccoli Cheese. And in the Judge’s 3rd place: Bernice Blankenship for Italian Sausage tied with Bonar’s Diner in Mayville for their Vegetable Beef soup. First place winners were given a prize and bragging rights. Cross Roads Farm and Craft Market is located at 6017 Westfield-Sherman Road, Westfield NY 14787. It is open from 9-5 each Saturday from April 30 until December 17. 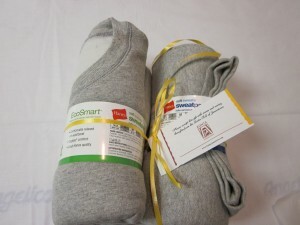 For more information, visit www.TheCrossRoadsMarket.com, or find us on Facebook. To learn more about “Lily’s Hope” or to schedule an appointment, call the WCA Cancer Treatment Center at (716) 664-8670. 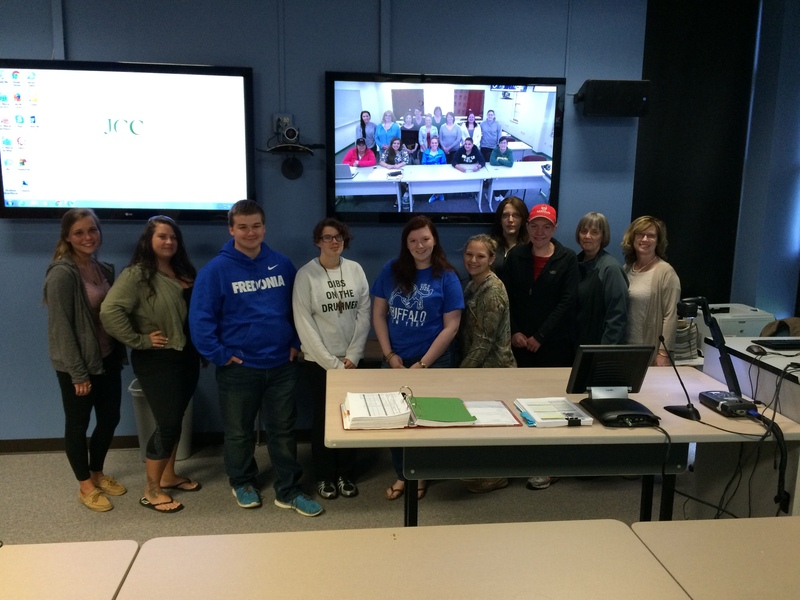 Students shown in Jamestown and Olean with their Instructor, Theresa Baginski at the JCC Distance Learning lab. 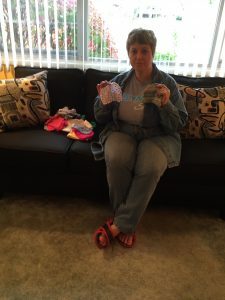 Theresa is a member of the Zonta Club of Jamestown and is taking birthing kits on their journey. 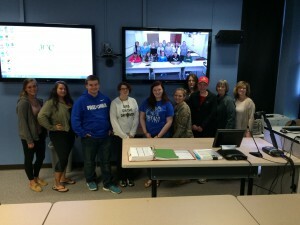 Twenty-five Jamestown Community College students will be traveling to Guatemala at the end of the spring semester. The group is representative of multiple academic disciplines including: Nursing, Occupational Therapy, Education and Criminal Justice. Participants will spend two weeks living with Guatemalan host families, studying Spanish at La Union in Antigua, and volunteering in rural communities. The students will also be taking with them 150 ‘Birthing Kits’ assembled by the Zonta Club of Jamestown. 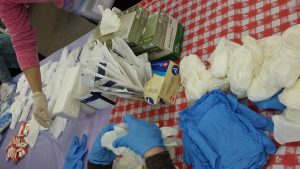 A Zonta District 4 project, the birthing kits contain: a 3X3 sheet of plastic, a pair of latex-free gloves, cord ties, a razor blade, a small piece of soap and gauze pads used to create a ‘clean’ birthing experience for women who do not otherwise have a hospital-like environment. The kits are assembled by Zonta Club members using a clean process and are intended to be utilized by a midwife or other obstetrical healthcare providers in the country to which they are sent. Birthing kits have previously been sent by the local club to Haiti, Honduras, South Africa, Nepal and Afganistan. 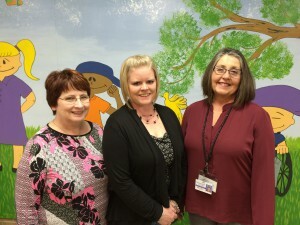 (L-R) ZONTA CLUB MEMBERS: EILEEN HEALY (Book donor and member of) THE SERVICE COMMITTEE, AND KELLIE WARNER, COORDINATOR OF ZONTA’S COLLECTION OF BOOKS; STAND WITH SHARI GRICE, A NURSE HOME VISITOR WITH THE NURSE-FAMILY PARTNERSHIP. Mayville, NY, March 15, 2016 – As part of their role in helping to give area babies the best possible start in life, staff with Chautauqua County’s Nurse Family Partnership and Maternal and Infant Community Health Collaborative encourage families to read to their children, starting in early infancy. There was just one problem: many of the homes they visit were very short on books. “Community Health Workers and Registered Nurses with our program are not simply delivering books to the home; they are using these books to model the type of positive parent-child interaction that stimulates early literacy skills,” states Ms. Burgess. According to experts at National Association for the Education of Young Children, such early literacy skills might include allowing infants to play with books as objects, pointing out colors, shapes and familiar objects to the child, helping an older baby to turn pages, and getting into the habit of holding and reading a book with a baby, even if it’s only for a few minutes at a time. “Reading was a big deal when my daughter Macie was growing up. We read every night. So, I can’t imagine not having books to read with the kids.” Said Kellie Warner, member of the Zonta Club of Jamestown. Kellie helped to coordinate a collection of books from the Zonta Club members to help kick off the program. To make a donation to Books for Babies of new or gently used board books or other books geared to very young children, contact Cathy Burgess at 753-4783. Ellen Munella, secretary and service co-chair for Zonta Club of Jamestown, at left, and Rosie Papalia, president-elect, at right, look at titles recently added to the collection at Prendergast Library with Tina Scott, library director. 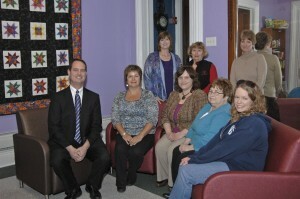 A donation from Zonta Club of Jamestown made the purchase of new print and eBook titles about women’s issues possible. 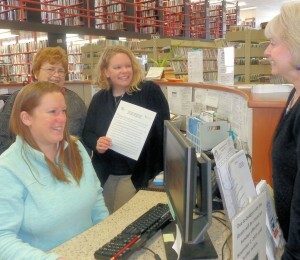 Library Associate Joanna Sorensen, seated, and Library Director Tina Scott, far right, show eBook titles available through Prendergast Library to Ellen Munella, secretary and service co-chair for Zonta Club of Jamestown, and Rosie Papalia, president-elect. New materials about women’s issues in print and eBook formats have been added to the library’s circulating collection through the generosity of the Zonta Club of Jamestown. 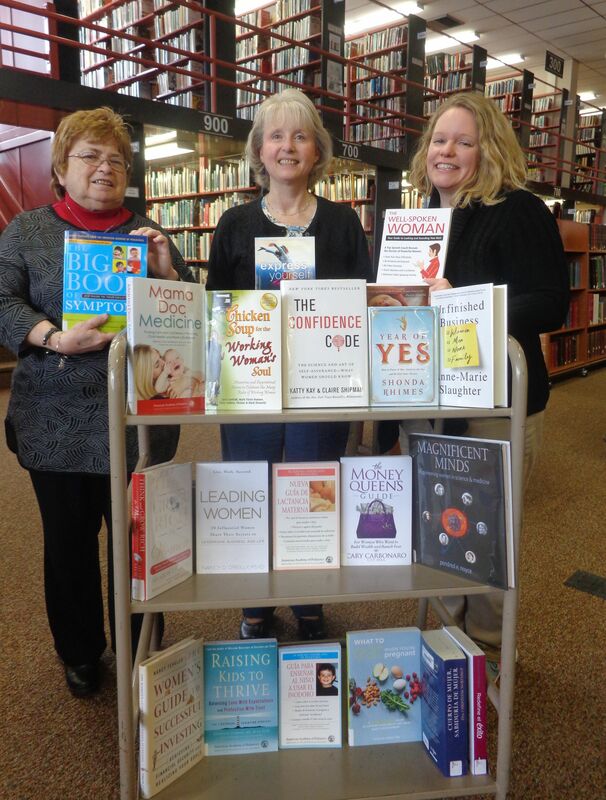 Prendergast Library has added new books about issues of special interest to women with support from the Zonta Club of Jamestown. “Local women will use these materials to access information that affects their well-being and that of their families,” said Director Tina Scott. 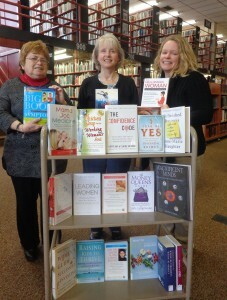 Zonta Club collaborates with the library as part of its mission of advancing the status of women locally and worldwide. Zonta members have previously provided materials about pregnancy, birth and infant care; women’s health and workplace concerns; and challenges for females during adolescence. New titles include “Chicken Soup for the Working Woman’s Soul” by Jack Canfield; “Year of Yes: How to Dance It Out, Stand in the Sun and Be Your Own Person” by Shonda Rhimes; and “Express Yourself: A Teen Girl’s Guide to Speaking Up and Being Who You Are” by Emily Roberts. For area residents who would like to borrow the new print books, there is no charge for a library card, and the library is open 65.5 hours a week for browsers’ convenience. The eBooks can be downloaded remotely from the library’s website. 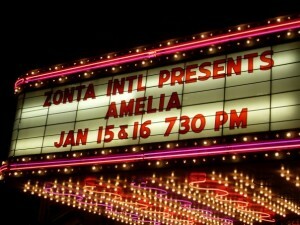 To learn more about the Zonta Club of Jamestown, see www.ZontaJamestown.org or visit its Facebook page. Prendergast Library is located at 509 Cherry St., Jamestown. Information is available at 484-7135 or www.prendergastlibrary.org. Proceeds of Tour de Zonta 2014 will benefit the victims of domestic violence at local and international levels. Chautauqua County’s rolling hills, lakes, villages and views. Ride 1 – 50-60 miles, starts at 8 a.m.
Ride 2 – 30-35 miles, starts at 8:30 a.m.
Ride 3 – 13-16 miles, starts at 9 a.m.
Ride details for each group provided at registration tent. after the ride featuring fresh foods grown locally. Lunch and support available until 2:30 p.m. Please note: Roads are not closed to traffic. Zonta International; Founded in 1919, Zonta International is a global organization of executives and professionals working together to advance the status of women worldwide through service and advocacy. 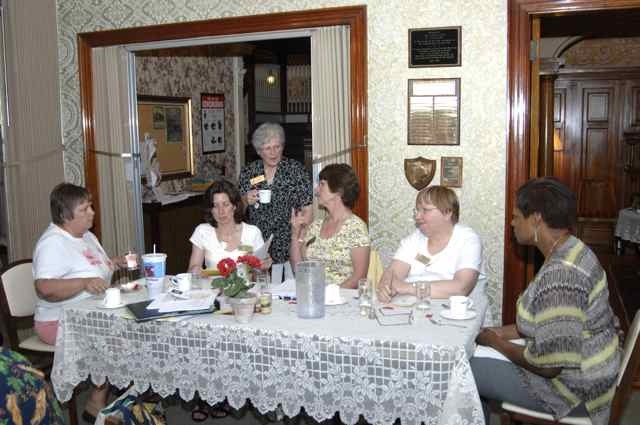 Zonta Club of Jamestown; The Zonta Club of Jamestown, chartered in 1921, is one of over 1200 clubs in 65 countries that make up Zonta International. Our service projects and scholarships assist local women. Friday, March 8th , 20136:00 p.m.
Paige Mecca, Solar Liberty Foundation, www.solarliberty.org. To make a reservation for International Women’s Day dinner, please fill out this coupon and mail a check made out for the total amount to “AAUW Jamestown Branch.” Include your email address, so confirmation of your reservation can be sent to you. All orders must be prepaid. Dinner is $25 per person. Mail your coupon and check to Maggie Irwin, 33 LaSalle Avenue, Jamestown, NY 14701. Questions? Email: [email protected] or call 716.483.5448. Reservations must be received by Monday, March 4th. Ride details for each group will be found on the cue sheets available at registration. Fee includes snacks and water along the routes; access to SAG vehicles if needed; T-shirt commemorating the event (T-shirt not guaranteed for those who are not pre-registered) Free parking “Farm to Fork” luncheon at the Plumbush Barn after the ride featuring fresh foods grown locally. to view new furniture that was purchased for the Agnes Home living and dining rooms. The purchase was made possible by a donation of $7500 from Zonta Club. Seated left to right are: Gary Kindberg, Salvation Army board member; Candy Jett, Zonta Service Committee Chair; Stacey Tanner, Anew Center Program Director; Ellen Munella, Zonta Club Service Committee member and Rosie Papalia, Zonta Club member. Standing, left to right are: Diana Butcher, Shelter Manager; Kathy Crocker, Salvation Army board member; and Shauna Anderson, Zonta Club President. The Salvation Army Anew Center’s domestic violence and sexual assault 24-hour hotline is 661-3897 or 1-800-252-8748. This fun bike ride is open to individuals and families of all ages and abilities. The ride will start and end at the Plumbush Bed & Breakfast, which is located on the Chautauqua Stedman Road, just one mile from the Chautauqua Institution main gate. Water and healthy snacks will be provided at checkpoints. Thank you to all who participated in the Tour de Zonta – we are looking forward to seeing you again next year! For those of you who would like to learn more about this fantastic event, on Saturday, July 9, 2011 we had a wonderful start to what would turn out to be a very successful Zonta event. 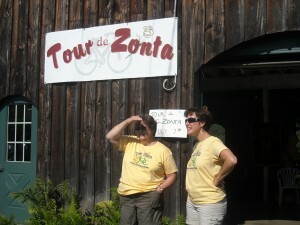 Over eighty riders participated in the first Tour de Zonta, held at Plumbush Bed and Breakfast in Stedman, NY, to benefit Zonta International Foundation. Our focus was on ending human trafficking. 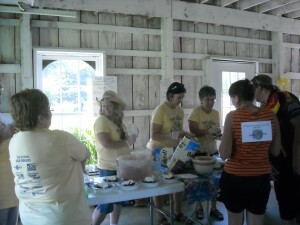 A delicious farm-to- fork lunch was provided by Mary Rappole, owner of Plumbush, and served by Zonta members. Veggie wraps and other food items featured locally grown fresh and home baked foods. Everyone enjoyed the wonderful entertainment provided by Randy Graham. People stayed and sat on the lawn just to visit and listen. 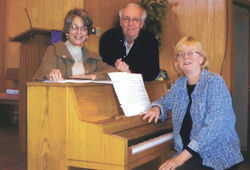 On May 7, 2011, the production of ‘I do, I Do’ was performed as a benefit to the Zonta Club of Jamestown. The fantastic show raised over $1,400 that will help with our service fund! 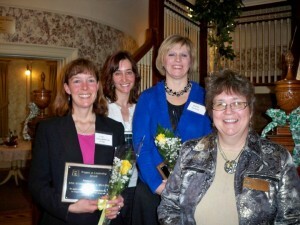 Pictured are our 2011 Women in Leadership Award Honorees L-R: Lisa Schmidtfrerick-Miller, Pastor Amy Rohler, Karen Surkala and our sister-Zontian, Roz Newton. It was a beautiful day to advocate for the victims of Domestic Violence and raise awareness of the work of Project Crossroads. 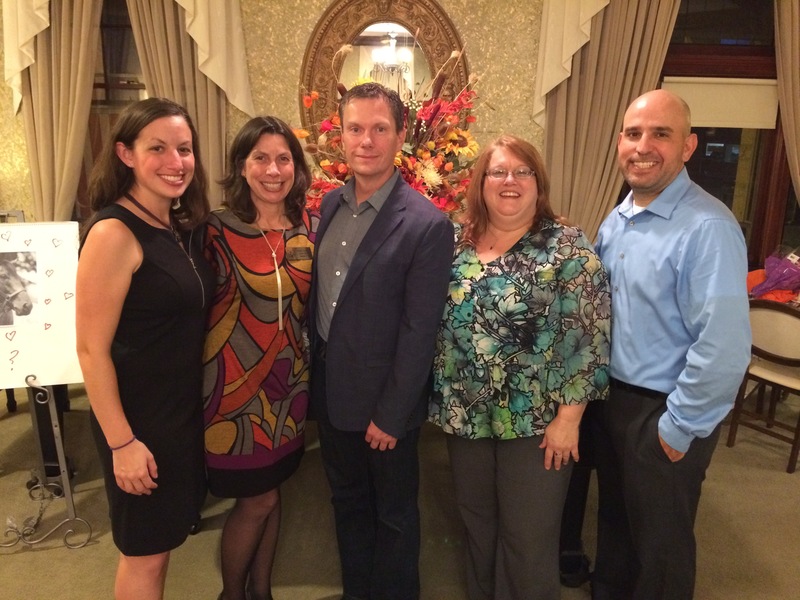 Zonta was proud to be there! On September 21, 2011 – Jamestown Community College is sponsoring this one-woman drama exposing the struggles and triumphs of Madame Marie Curie (née Maria Skłodowska ) —an academically impassioned, vehemently private, fervently Polish scientist, mother, and teacher. From the political oppression of her childhood, to scientific emergence and fame to the tragedy that forced her into single motherhood as well as further world prominence, this is a life that challenges our assumptions about what one person can achieve and the responsibilities of science. About the Presenter: Susan Marie Frontczak has brought literature to life, created stories from thin air, and honed personal experience into tales worth telling again and again. She plays in theatres, corporations, schools, libraries, and festivals internationally. Susan will join us during the dinner. 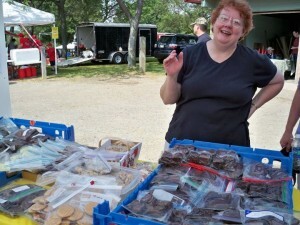 The Zonta Club of Jamestown setup a Bake Sale booth at the Jamestown Labor Day Festival Sept 4th, 2011. We made over $600!!! Yay! This goes toward our service funds to assist local programs and elevate the status of local women and girls. 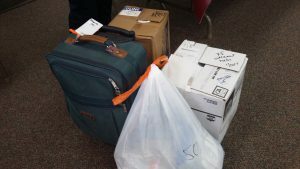 Zonta Club of Jamestown continues to recognize that women who are in the ER for sexual assault or violence might need to give their clothing to be processed by the police. For this reason the Zonta Club of Jamestown has donated clothing to the hospitals of Chautauqua County (WCA Hospital, Brooks Memorial Hospital, and Westfield Memorial Hospital) so these women are able to go home in comfortable and clean clothing. 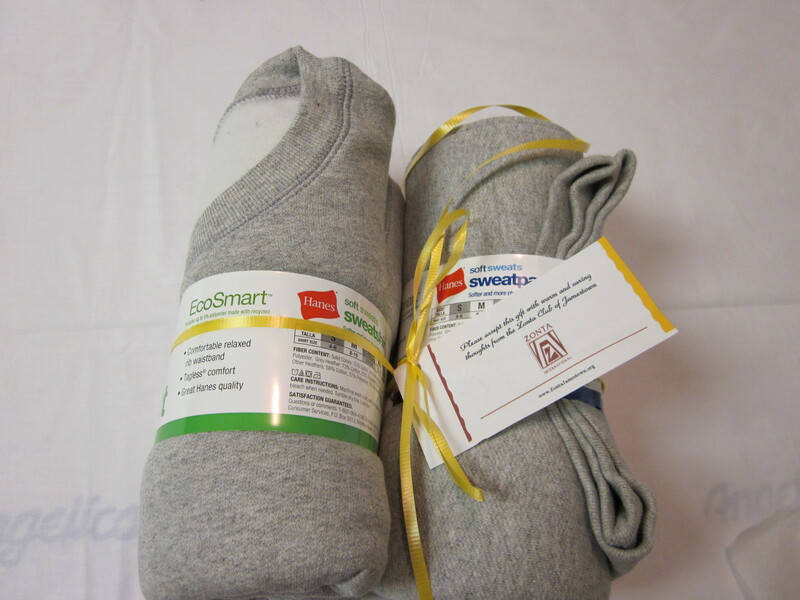 Each of the clothing packages included the following: sweatshirt, sweatpants, and undergarments. Zonta Club of Jamestown worked hard to education on numerous programs (Birthing kits, pictures, posters and laptop at end of the table playing our Aussie Birthing Kit video) during the Women’s Wellness Expo in the Riverwalk Building in February 2011. One of our very own was even in the fashion show! 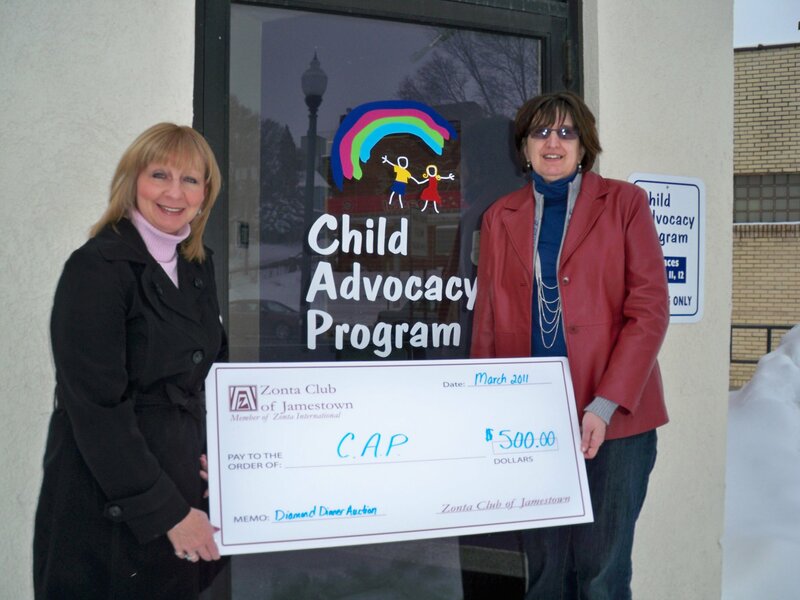 The Zonta Club of Jamestown donated $500 to the Chautauqua County Child Advocacy Program (CAP) to help them in reaching their goal to expand their offices and include on-site counseling for children and their families as they go through the court system. 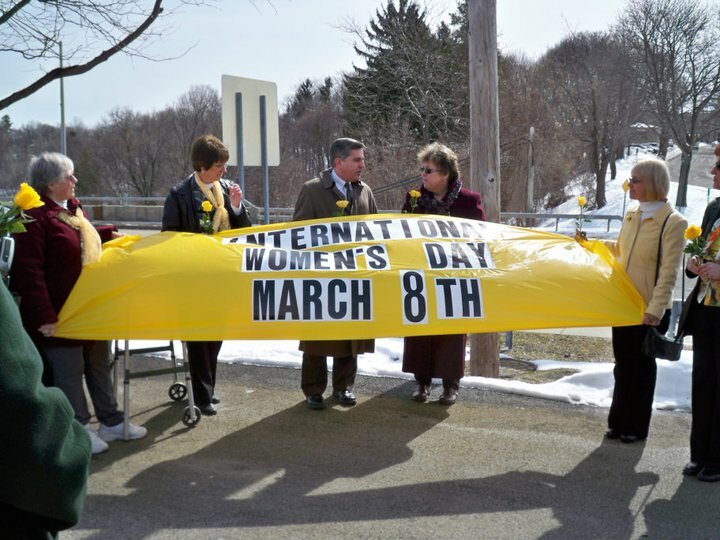 The Jamestown Zonta Club will mark the celebration of the 100th anniversary of International Women’s Day at noon Tuesday at the west end of the Third Street Bridge, near the Office for the Aging and Veterans Administration offices. As part of the event, County Executive Greg Edwards and Mayor Sam Teresi will speak. 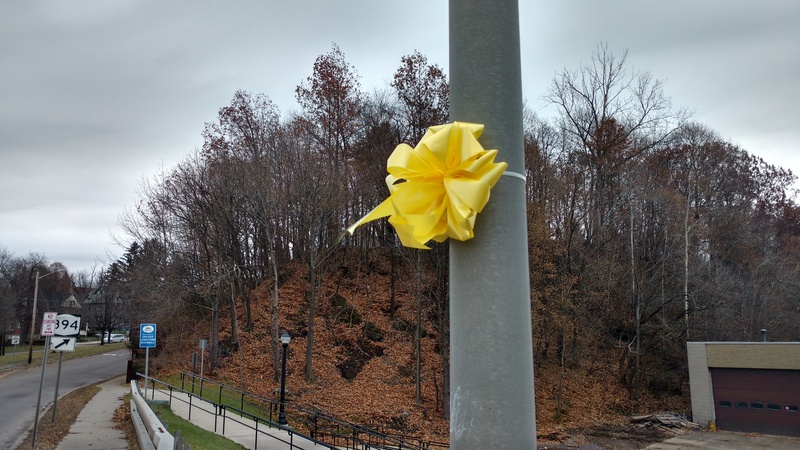 Club members will decorate the area with bright yellow ribbons. Anyone celebrating the day is asked to wear yellow. 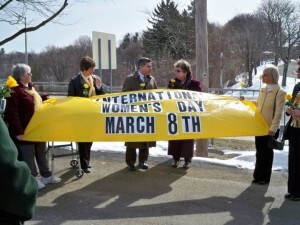 Celebrated annually on March 8, International Women’s Day was officially established in 1977 by the United Nations as a day for women’s rights and international peace; however, the earliest International Women’s Day celebration dates back to 1911 when more than one million women and men in Austria, Denmark, Germany and Switzerland attended International Women’s Day rallies campaigning for women’s rights to work, vote, be trained, hold public office and end discrimination. March 8 also marks Zonta Rose Day, when Zonta clubs around the world raise awareness in their local communities of Zonta International’s mission to advance the status of women worldwide. 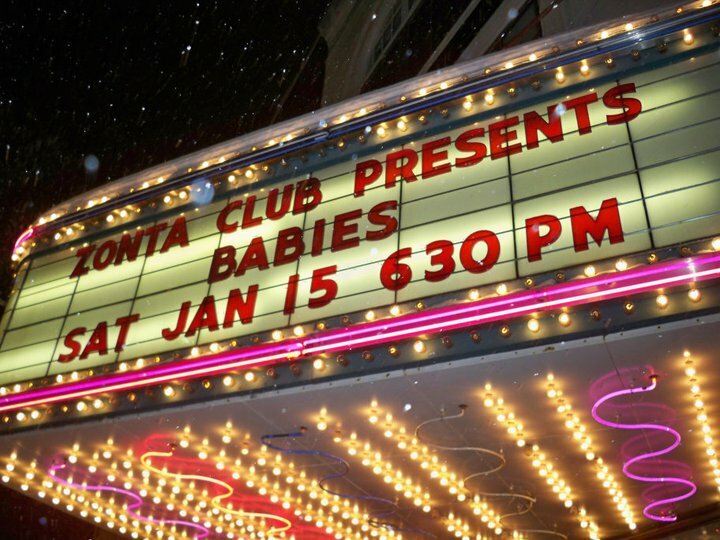 “Babies!” The phenominal worldwide documentary event, went to the Reg Lenna Civic Center on Saturday January 15th at 7pm and was sponsored by the Zonta Club of Jamestown! “Babies”, rated PG, is a look at one year in the life of four babies from around the world: from Mongolia to Namibia to San Francisco to Tokyo. A large crowd joined Zonta at the Reg Lenna starting at 6:30pm for Zonta basket raffles, drawings and a 50/50! The event started at 7pm with a brief slide presentation on the Zonta Club’s Birthing Kit project and how we in Chautauqua County are impacting the world – from Haiti to Honduras, Africa and Afghanistan. The Zonta Club of Jamestown float tree is lit and decorated with glittery golden “Z”s and Flags from around the world! Our signs on each side, and Yellow ribbon magnets adorn the rest of the space available on the truck! Thanks to Shults Auto Group for their generosity – the loaner truck and the space to tie the tree down at Express Lube. 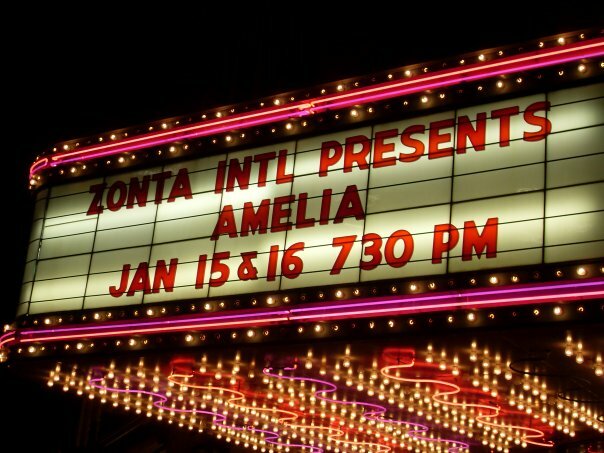 The Zonta Club of Jamestown presented the movie “Amelia” at the Reg Lenna Civic Center in Jamestown recently with more than 500 people attending the two showings. A short presentation from the Chautauqua Institution archivist and historian Jonathan Schmitz preceded the movie to discuss Amelia Earhart’s landing at the Chautauqua Golf Course in July 1929. It showcased the four-hour visit Amelia had with the Bestor family and the lecture she’d given to more than 5,000 people at the historic Amphitheater on the grounds at Chautauqua. – Donations to Several Agencies by way of time or money: Child Advocacy Program, YWCA TEAM, Boys and Girls Club, JNP, and many more.